Tonight she enforces the rule that there's no such thing as too much theatricality, rolling her Rs with relish during the Russian-language verses of Apres Moi, and adding helium-squeak high notes to the choruses of Bleeding Heart. 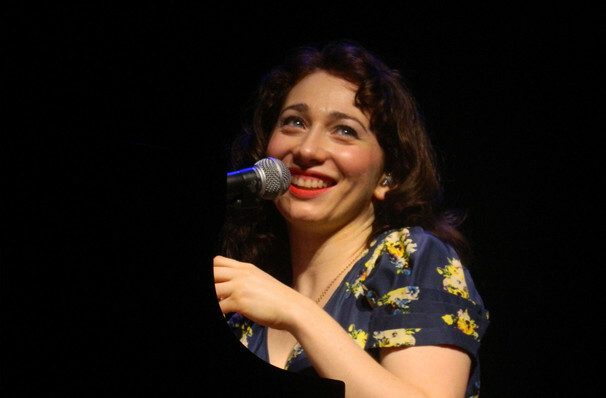 As part of the brand new In Residence On Broadway concert series, Grammy nominated indie-pop songstress and New York native Regina Spektor will take to the Lunt-Fontanne Theatre stage for five special performances this Summer. It's not the first time the celebrated singer songwriter has had connections with Broadway, back in 2016 she performed and recorded the fatherly ballad 'Dear Theodosia' with Ben Folds for the Hamilton Mixtape. Born and raised in Moscow until she left for the states at age nine, Spektor was inspired early on by her father's bootleg copies of western pop and rock music, as well as her kaleidoscopic immersion in American pop culture in her second home of the Bronx, New York. A classically trained pianist, she made her mark on the East Village's anti-folk music scene before breaking into the mainstream with her eclectic and highly emotive brand of intellectual pop with the re-release of her third album Soviet Kitsch. Don't miss brand new Broadway-themed arrangements and no doubt theatrical performances of seminal hits like 'Bleeding Heart', 'Us', 'Fidelity' and 'Laughing With'. Seen Regina Spektor? Loved it? Hated it? Sound good to you? 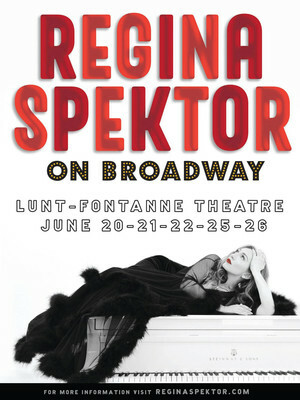 Share this page on social media and let your friends know about Regina Spektor at Lunt Fontanne Theater. Please note: The term Lunt Fontanne Theater and/or Regina Spektor as well as all associated graphics, logos, and/or other trademarks, tradenames or copyrights are the property of the Lunt Fontanne Theater and/or Regina Spektor and are used herein for factual descriptive purposes only. We are in no way associated with or authorized by the Lunt Fontanne Theater and/or Regina Spektor and neither that entity nor any of its affiliates have licensed or endorsed us to sell tickets, goods and or services in conjunction with their events.